Once you have been given an account, and have the credentials (username & password) from My SCW, you can login…. 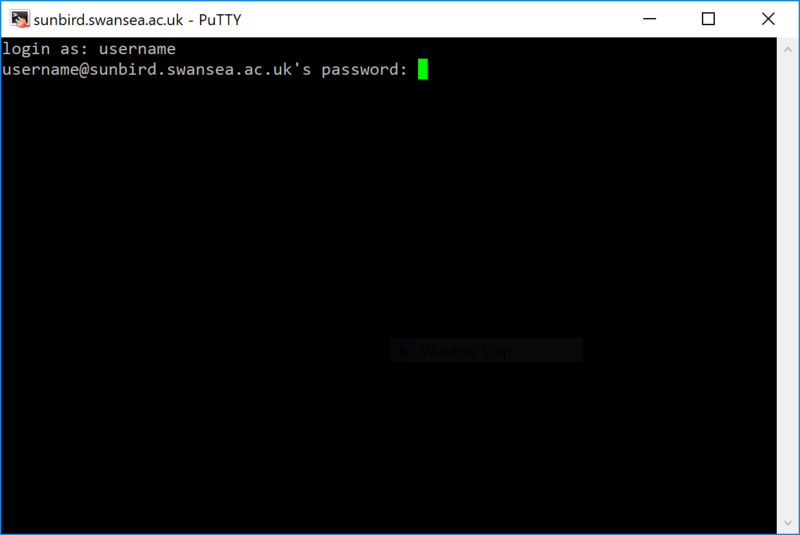 To access Supercomputing Wales (SCW) systems via the command line, you must use a terminal emulator, which connects your local keyboard and screen to the remote system. This uses a protocol called “Secure Shell”, or “SSH”; this is available as standard with a Linux workstation or Mac, but requires a program to be downloaded and installed with Microsoft Windows. The SCW infrastructure consists of two compute clusters, one based in Cardiff and the other based in Swansea. Each of these clusters has its own ‘Login Nodes’, which enable you to execute and manage jobs on that particular cluster. Please see details linked from the front page of the User Portal. Aberystwyth users should login to the Swansea system. Bangor users should login to the Cardiff system. If you are logging in from a Windows system you may need to install an SSH client. The PuTTY software is recommended and can be downloaded from the PuTTY website. In order to log in to SCW Cardiff cluster, enter “<username>@hawklogin.cf.ac.uk” into the “Host Name (or IP address)” box; where “<username>” is your SCW username given to you at registration. You may wish to save this information for reuse, in which case also enter a name in the “Saved Sessions” box, and hit the “Save” button. After entering the address of the machine you wish to log into (“hawklogin.cf.ac.uk”), click on the “Open” button to connect to the SCW cluster. 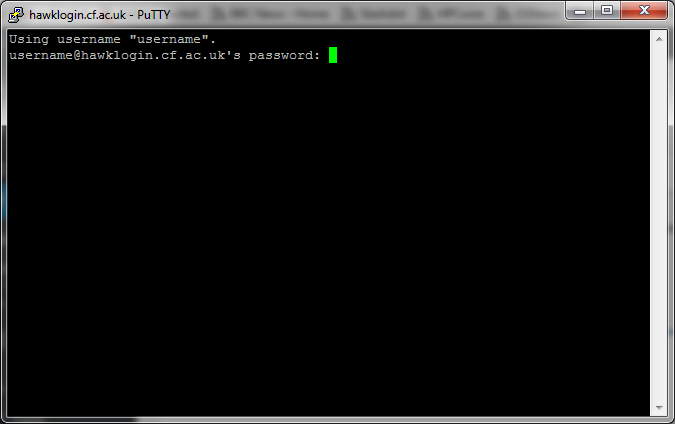 You are now set to log in – now enter your password and you should now have a command prompt. Please skip the next section “Logging in from Linux” and proceed with section “Entering your password”. In order to log in to SCW Swansea cluster, enter “<username>@sunbird.swansea.ac.uk” into the “Host Name (or IP address)” box; where “<username>” is your SCW username given to you at registration. You may wish to save this information for reuse, in which case also enter a name in the “Saved Sessions” box, and hit the “Save” button. After entering the address of the machine you wish to log into (“sunbird.swansea.ac.uk”), click on the “Open” button to connect to the SCW cluster. The authenticity of host 'hawklogin.cf.ac.uk (131.251.129.4)' can't be established. ECDSA key fingerprint is SHA256:P8MxFCLE7+ROcYqIdFRZSZ1WI7CKGIWsJ96o5vjZluo. ECDSA key fingerprint is MD5:31:fc:cb:35:fa:7c:90:37:ef:4c:f7:3d:55:3c:01:3e. You will then proceed to be asked for your password, and can continue with the next section on logging in (which is common to both Linux and Windows). Your password is the one you chose when signing up for a Super Computing Wales account. If you forgot your password and need to reset, login to My SCW with your university credentials and reset it. External users will need to contact the helpdesk. You are now at the command prompt of a SCW cluster login node . Tip: Note that with the shell command line, you can use the left and right cursor keys (arrow keys) to move the cursor around the current line of text at the command prompt and edit it – to remove any mistakes or change your mind. Similarly, pressing the up or down arrow will bring back the previous command you typed. Pressing the up arrow repeatedly will show older and older commands – whereas the down arrow will bring you back to the last command you typed, or press it again – back to a blank line ready for you to start a new command. For next steps, please see other pages on the SCW User Portal.